One of the first board games I ever had was a kids' version of Scrabble called "Scrabble Junior." It had yellow cardboard letter tiles instead of regular wooden ones and simplified rules, but other than that there was no real difference between the junior version of the game and the real one. 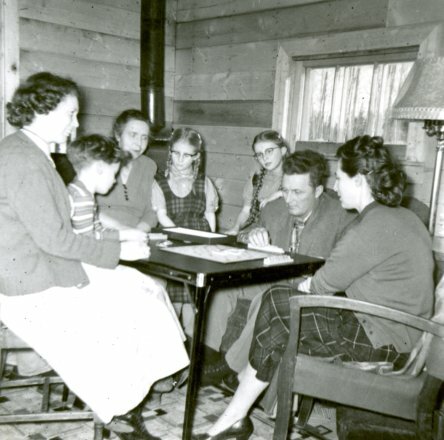 I got to know this pretty quickly, since one of the three board games my grandparents kept at their house where we vacationed each summer was the regular version of Scrabble. As I got older I perhaps naturally came to like regular Scrabble better than the junior version, since the more complicated rules made it more interesting. The best, though, was a Scrabble-like game called "Upwords" that my family got later on, which let you stack letter tiles over ones that had already been played on the board. This allowed for the most creative strategies of all, and added the interesting possibility that a stack of letter tiles would get so tall that it would topple over and thus suddenly end the game. I can't say that Scrabble was one of my favorite board games--I preferred Monopoly and Clue--but I do have some fond memories of playing it with various family members.